Kayak Lake Powell rents a variety of kayaks, canoes, stand up paddleboards, and camping equipment for self-guided trips on Lake Powell or the Colorado River. 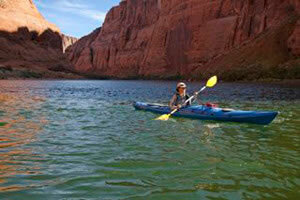 They also provide fabulous day and overnight tours in several beautiful areas of Lake Powell. Their focus is on smaller tour groups and always take the guests out at the best time of the day. 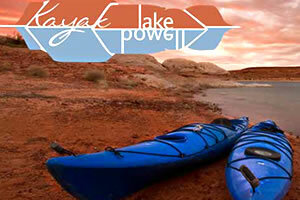 The Kayak Lake Powell rental office is an 18 minute drive to Lake Powell. All rentals include equipment and instruction on how to safely transport your rental equipment to the launch point of your choice. Experience the stunning scenery and unique geology of Glen Canyon! 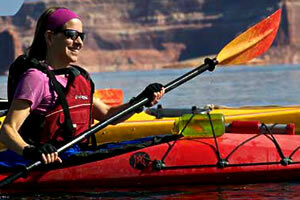 Kayak Lake Powell offers sit-on-top and touring canoes for singles and couples as well as stand up paddle boards. They also rent canoes for overnight Colorado River trips which you can pick up only minutes from the river! A typical vehicle will carry 1 canoe. They also have a large selection of outfitting gear that you can rent or buy; including tents, wetsuits, drybags, disposable toilet bags, folding camp toilet, water purifcation tablets and drops, sun shelters, camp stoves, and much, much more. Half day (2 – 3 hours) guided kayak tour starting from Lone Rock beach. Superb variety. Paddle beneath massive cliffs and glide into a quiet side canyon. Hike up to an overlook for fantastic scenery and, if you’re lucky, bighorn sheep. Enjoy amazing swimming spots in the warmer months. Great for children. Calmest and coolest in the morning, beautiful colors at sunset.Meeting times vary by month in order to give you the best experience possible. We know when it’s best because we paddle everyday! Tour length may vary depending on Lake Powell water levels and your paddling experience. See world famous Antelope Canyon from the water! Full day (6 hours) guided kayak tour starting from Antelope Point launch ramp. Using touring (sit inside) kayaks, cruise under the deep canyon walls to the very end, then further explore on foot. While you won’t visit the upper section of the canyon where the large groups go, the areas you’ll visit are stunning and the solitude makes the experience much more enjoyable. Meets at 6am from May through August, 7am in most other months. Includes breakfast in the canyon about halfway through the tour. A decent amount of fitness and some paddling experience is required, especially in the spring. Full day (6 hours) guided kayak tour starting from Stateline launch ramp. Using touring (sit inside) kayaks, explore interesting rock formations, islands, and inlets. Ice Cream Canyon offers impressive narrows and quiet backwaters. You’ll hike up to the Wahweap Window. It’s a massive cave with beautiful overlooks of the lake. Maybe just as important, it may be the best lunch spot ever on a hot day! Meets at 8am and returns by 2:30pm. Lunch included. Please note “Ice Cream” when requesting this full day tour. Want to experience the desert night sky away from city lights? Want to wake up with a colorful sunrise and an invigorating swim? Want to enjoy a tasty meal around a camp fire? Want to really experience Lake Powell? If so, go on an overnight tour! You’ll explore side canyons and relax in camp – a great combination! Includes all camping equipment, 2 meals, and snacks. Meets at 3pm and ends between 10 to 11am the following day. Motor uplake then kayak to the very end of an amazing slot canyon. On foot you’ll explore Labyrinth’s narrows and see beautiful colors, patterns, and formations. You’ll also be treated to sweeping views of Padre Bay, the widest part of Lake Powell. Includes all camping equipment, 4 meals, snacks, and round trip motorboat shuttle. Meets at 7am and ends between 2-5pm the following day. Visit two of the most impressive canyons on the lake, but each is completely different! In Labyrinth Canyon you’ll explore a slot canyon with beautiful colors and patterns. For those seeking a great adventure, West Canyon awaits. Cross pools of water as you go farther into one of the deepest and most amazing canyons. Includes all camping equipment, meals, snacks, and round trip motorboat shuttle. Best in autumn, book now! 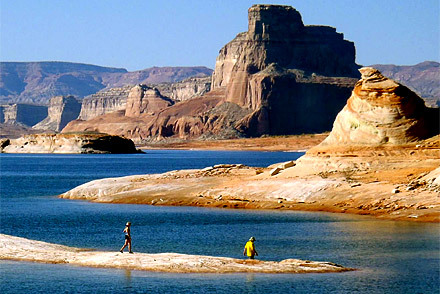 The Escalante is described as the best area of Lake Powell. Visit the last known camp of Everett Ruess. Glide by the ancient Anasazi Three Roof Ruins. In well-named Explorer Canyon, see arches, ruins, and petroglyphs! Paddle up incredibly narrow and deep Clear Creek Canyon to the location of Cathedral in the Desert, which will be impressive at current water levels. Includes all camping equipment, meals, snacks, and round trip motorboat shuttle.